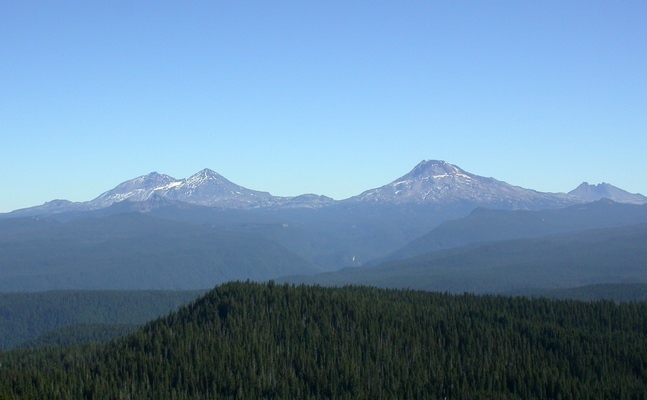 What more could a group of Obsidian hikers want than a glorious fall day, an uncrowded trail through beautiful vegetation and a moderately tough climb to the top of a mountain sporting a 360 degree view? Starting at the Pat Saddle trailhead above Cougar Reservoir, we climbed gently through a forest of Douglas firs and hemlocks with occasional glimpses of the Sisters. 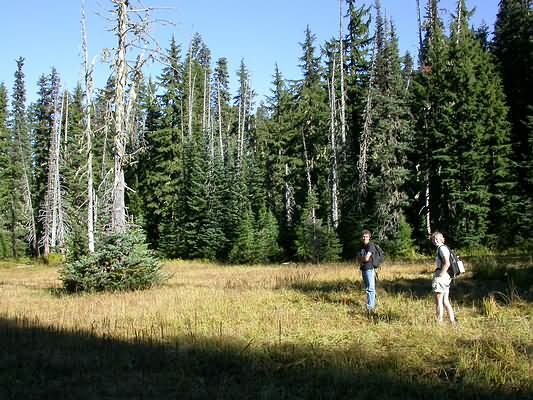 After a couple of miles, we turned onto another trail to climb more steeply through meadows of beargrass and huckleberry bushes [olallie is the Northwest Indians’ Chinook jargon word for “berry”]. 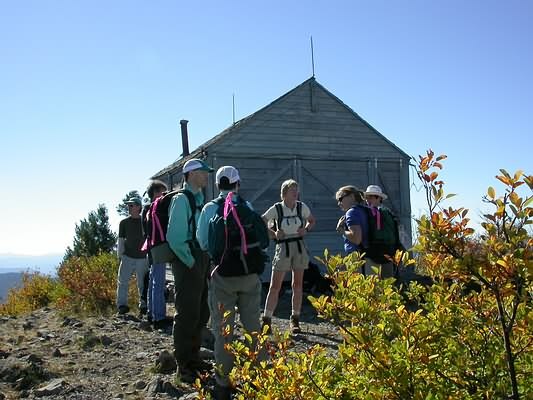 The trail finally switchbacked up to the summit where an intact lookout hut stands. We found a spectacular view of Mts. Hood, Jefferson, Washington, the Sisters and more peaks. The weather was warm enough for us to remain for a while before heading back down. 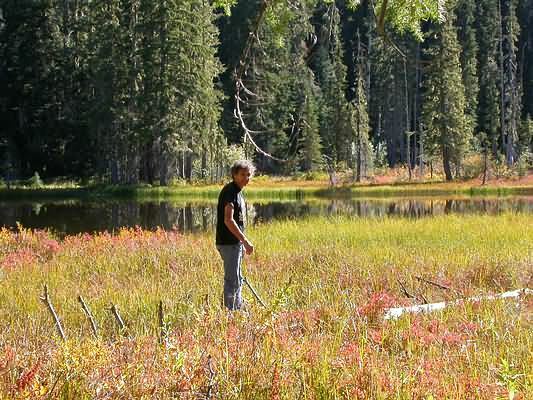 Six of us took a short sidetrip, bushwhacking to Wolverine Lake, a somewhat swampy but pretty site. Once back at the trailhead, some of us decided it was too nice a day to go home, so we explored the continuation of the Olallie trail heading toward Horsepasture Mtn. We climbed another 700' feet looking for The Potholes. After a bit of trail confusion, we found a rather unused trail leading down to meadows that we assume were the site of these potholes. We did find a couple of holes with water in them! 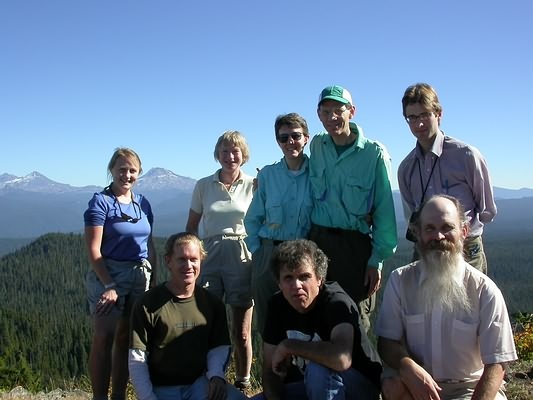 Hikers were Wayne Deeter, Mel Zavodsky, Kristin Peterson, George Baittinger, Mary Fechner, Jim Fritz, Iwo Lojasiewicz and Chris Stockdale, leader.